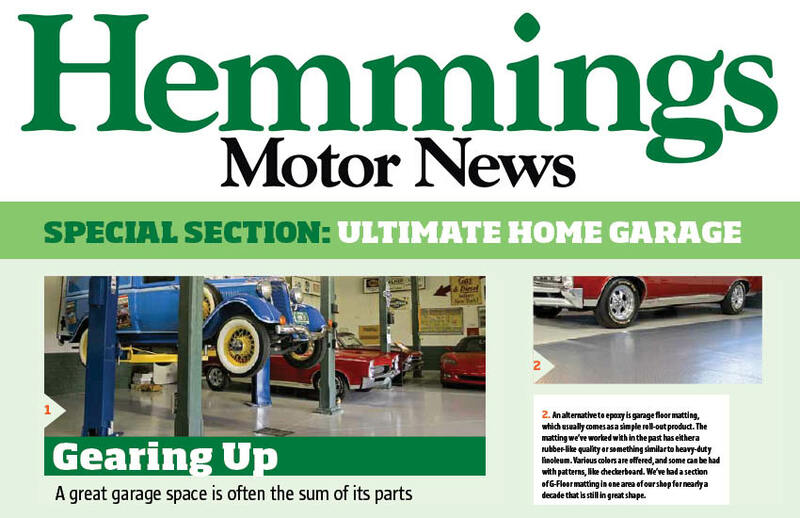 Hemmings Motor News, considered “The bible” of the collector car hobby since 1954, publishes a monthly magazine catering to traders and collectors of antique, classic and exotic sports cars. It is the largest and oldest publication of its kind in the United States. “Plenty of functional shops still have bare concrete underfoot, but from our experience, nothing transforms a cold, stark building like some sort of floor covering.” McGean discusses floor covering options such as epoxy coatings, and less permanent options like garage floor tiles and roll-out matting. Hemmings and McGean suggest another great option for workshop and garage flooring: heavy duty garage tiles. Most of these tiles are rated to handle significant weight and allows for easy rolling of shelving and equipment on casters. McGean touts the tiles ease of installation, ability to alternate colors and the DIY trim-to-fit simplicity of fitting odd shaped areas. This entry was posted in G-Floor and tagged floor covering, garage floor matting, Garage Flooring, garage floortiles, roll-out matting, rollout garage floor mats, ultimate home garage, vinyl rollout mats. Better Life Technology Brands Are Proudly Made in the USA! Better Life Technology Celebrates National Mom and Pop Business Owners Day!